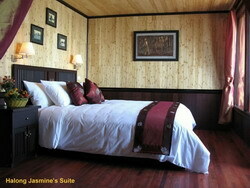 Welcome to the Halong Jasmine! 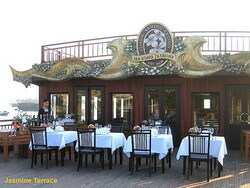 Enjoy the intimacy of a small party within the space of Halong Bay’s largest wooden junk. An impressive 55 meters long and 11 meters wide, Halong Jasmine can accommodate up to 80 passengers at one time across four luxurious decks, with an overnight capacity of 48. The attention to detail and quality of design is apparent in every inch of this newly-built junk, artfully marrying space, rich 1930s Indochina-style wooden décor and exquisite ornamentation throughout its air-conditioned bedrooms, restaurant, bars and communal spaces. Whether you want to throw a party on the sundeck, enjoy an intimate candle-lit dinner in the Jasmine restaurant, or just find a quiet nook to relax and unwind, Halong Jasmine is the perfect way to enjoy the bay. Fitted out in the 1930s Indochina style, the four-star Halong Jasmine is the epitome of luxury and sets the standard for services and amenities. 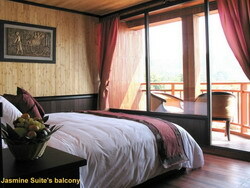 There are three different room options available. Each of the Jasmine suites and Jasmine Deluxe cabins are fitted with a private balcony to accentuate your personal enjoyment of the magnificent views across the bay.